A perfect lunch starts with a great sandwich. 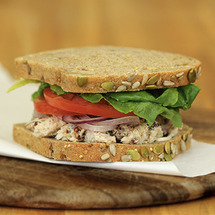 Great sandwiches start with great bread and great bread starts with fesh ground wheat! 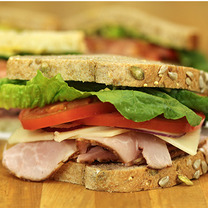 We offer classic, signature, and Panini sandwiches made with the finest meats, cheeses, and other toppings. 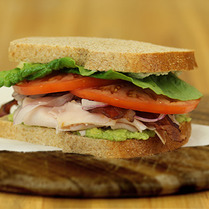 Fresh avocado, smoked turkey breast, crispy bacon, and a bleu cheese spread on Honey Whole Wheat. Chunks of white and dark meat chicken in a seasoned mayonnaise dressing with CAJUN PECANS.